This mantra, according to Matthew Crow, was the main brief given to Diageo’s team of Master Blenders when they were originally tasked with creating the Johnnie Walker Directors’ Blends. 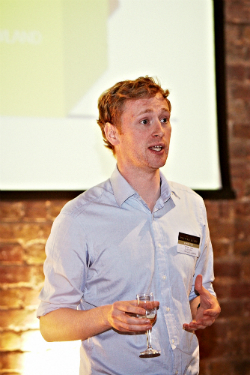 Matthew is one of the company’s top whisky specialists who, along with Dr. Jim Beveridge and the rest of the blending team, is responsible for creating the company’s world-beating blended whiskies. The Directors Blends are certainly special. These tiny batch blends – usually only five or six hundred bottles – are reserved for gifting by the company’s bigwigs and are not offered for retail sale. There are no requirements for the Directors Blends, other than it has to be a blend (obviously) and it has to be relatable to Johnnie Walker. There are also no restraints. Any whisky from Diageo’s almost unimaginable reserves can be used in these annual quests to the cutting edge; The Directors’ Blends are about exploring the boundaries of what is possible in whiskymaking. ‘Do Something Special’. It sounds easy, but of course with so much choice, so much free reign, comes big responsibility – as personal gifts from Diageo’s top brass to VVIPs, the Directors’ Blends have got to be very special. Matthew describes the Directors Blends as ‘an artist’s sketch – a study’, as each has a theme based around the company’s Cardinal Blocks, the elements of flavour used in the blending process. We do a little preliminary tasting as he explains the theory behind the Cardinal Blocks. These blocks are loosely regionally based, with six elements, of which we tasted four (unnamed) whiskies chosen as representative examples. First up was a sample of a single grain whisky, presumably from Cameronbridge. After a restrained nose, it revealed a very sweet, toffee character with some gluey, spirity notes and a faintly dusty finish. Next we had a nicely balanced Fresh Fruit single malt which, bearing in mind the Johnnie Walker DNA, I presume was probably Cardhu. In any event, it showed its fruit well, mainly green apples and pearskin with some pleasing coconut and caraway notes in the background. The third whisky we tried was a contrasting Rich Fruit Speyside malt, this one evidently heavily sherried. On the nose were brown sugar, raisins and spirit sulphur – surely this was Mortlach. The palate seemed to confirm it, with rich dried fruit and meaty sulphur notes. Matthew explained that these meaty, sulphury malts were essential in blending as they give the finished product weight and complexity. Last of the pre-samples was Island Smoke. 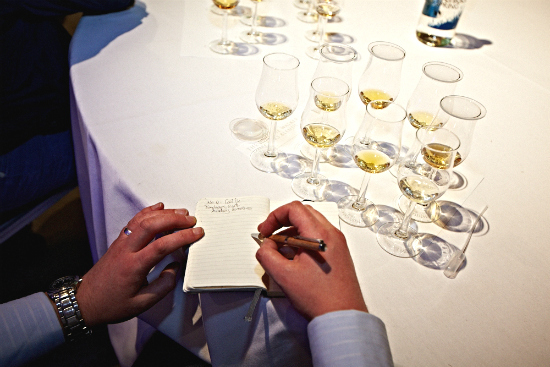 With fresh bandages, earth and a medium-smoky sweetness this had to be Caol Ila. It was its usual excellent self. With the starters out of the way, it was straight onto the first of our four main courses. The theme for this initial offering (if you don’t count the staff-only 2005 Directors Blend, which Diageo clearly don’t) was Grain – although there are a few malts in the mix to round things out and add complexity. Matthew revealed that all kind of wacky experiments had been conducted, including making a high-grain blend and marrying it in a very active cask. The final recipe included the full ticket of whisky styles: single grains, blended grain, blends, single malts and vatted (blended) malts. The nose was pure oak and woodglue – freshly sawn wood and nutty aromas. The palate had an amazingly soft texture and a very strong coconutty oak character. It was also very sweet, with pear flavours (again), dried apple and coconut, and hazelnuts. This time, the theme for the blend was Smoke. I expected to enjoy it, and did – this was probably the most complex of the blends that we tasted, with rich syrupy notes, BBQ pork, gammon, then some bandagey notes and dried herbs. Finally a sweet finish of cedar, apple jelly and some lovely turfy notes which just melted away – again, the texture was incredibly soft despite the deep flavours. This was my favourite of the tasting, the phenols were prominent without ever becoming dominant and the whole was exceptionally well-rounded. 2010’s theme was Speyside Fruit, and the blend certainly delivered on that, with fresh sliced apple, raspberry leaf, dried banana, white grape and peach aromas and flavours, along with a very well-judged wisp of smoke on the backdraft and a finish of dried raspberries, some honey-menthol and raspberry jelly. It probably suffered a little due to the tasting being done in chronological order but it still showed very well. Not quite well enough to dislodge the 2009 from the top of the tree in my affections, though. Finally it was time for the Johnnie Walker Directors Blend 2011 (the 2012 hadn’t been released at the time of the tasting). The theme here was Wood, and once again the blend was true to its word. A very pure oak character on both nose and palate, with lots going on: old books, polished furniture and some sweet barley sugar on the nose, then a very rich and silky palate, quite syrupy but saved from becoming flabby by some dry, woody flavours. Overall, the blend delivered a fascinating mix of young, sappy pinewood notes alongside the classic Old Church Pew flavours associated with long cask maturation. This was the only one of the blends I added water to, and it really worked, lifting the palate and releasing a whiff of smoke. Final thoughts – the Johnnie Walker Directors Blends are the real thing, a great example of pure blending talent let off the leash to create a testament to the craft – these were meticulously-constructed whiskies with real artistic brio. A word on the presentation, too – they are really smart bottles, all with a twist on the classic Johnnie Walker design motifs. Lastly, it’s worth noting that all these blends were bottled at 46% (apart from the 2009, which is at 43%) and they really are all the better for it. I understand why Diageo could never up the standard JW range to 43-46%, but I think something like Double Black would really benefit from a little extra oomph. Many thanks to Diageo for supplying the bottles for this fantastic tasting, and particularly to Matthew Crow for taking the time to come down and introduce us to them. 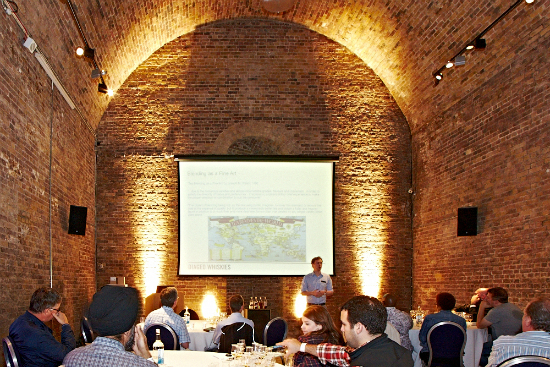 This was a great way to bring down the curtain on 2012’s Whisky Show Masterclasses in style.